AFP Deluxe Back Seat Hammock is no longer available. Please look here for suitable alternatives. All For Paws specialise in designing unique, stylish products for cats and dogs. The team behind All For Paws strives to continually design products that meet the needs of pets, but also fit the lifestyles of the owners. They are practical products with a story and purpose. All For Paws products are available worldwide and also at Vetsend.co.uk. 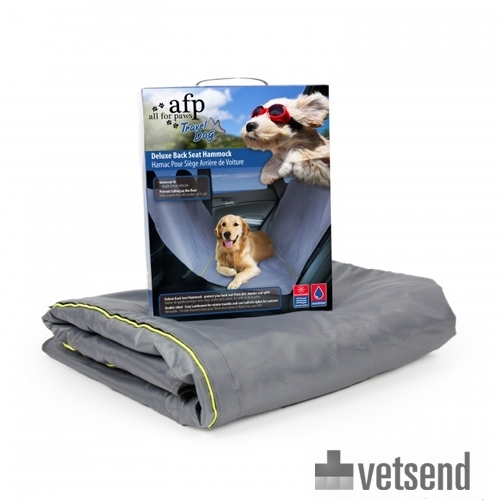 This backseat blanket from All For Paws provides protection when transporting dogs in your car. It creates a barrier so that your pet cannot climb into the front seat, and protects the back seat from moisture, mud, and other dirt. The Back Seat Quilted Lined Hammock fits into almost any type of car and is very easy to attach. The blanket has two different sides, perfect for seasonal changes. One side is soft and warm, perfect for winter and autumn. The other side is nice and cool, perfect for summer and spring. Have you used AFP Deluxe Back Seat Hammock before? Let us know what you think about this product.